Part of the Emergency/Crisis Action Plan response, used to provide each Crisis Team Member with a reference flip chart of procedures needed by team members. 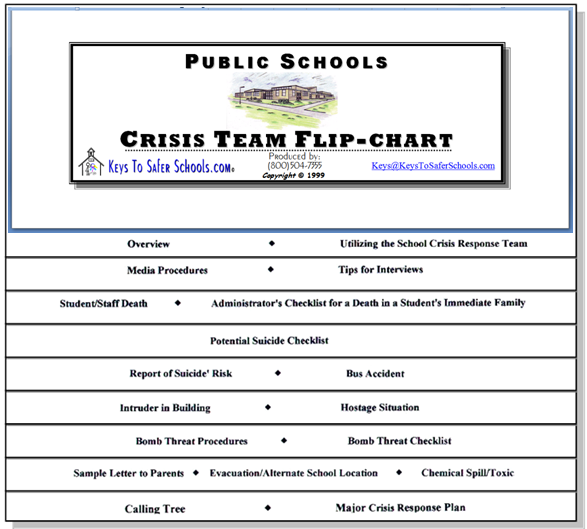 This flip-chart is a part of the Multi-Hazard Crisis/Emergency Operation Plans has drawn on a wealth of national research and years of professional experience to produce a Nationally utilized System for schools to follow in developing Team Members of the Emergency/Crisis Action Flip-chart tailored to their specific needs and situation. This flip-chart can be specialized for schools that have an already designed plan or based on the above training. This is based on the Emergency/Crisis Response Training. Note: Pictures are typical kits and may vary slightly from order to order. 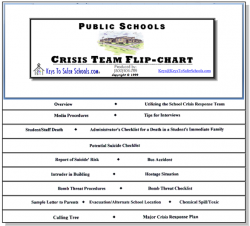 Buy Crisis/Emergency Team Flip-Chart - Packets of 20 and Classroom Crisis Action Flip-Chart - Pack of 100,Multi-Hazard Crisis/Emergency Operation Plans ,Multi-Hazard Crisis/Emergency Plan Drills Guide,Shelter in Place Kit,Visitor Badge Security Program.